A hidden world of vibrant colors, dynamic movements, and extraordinary shapes has come alive at Harvard. 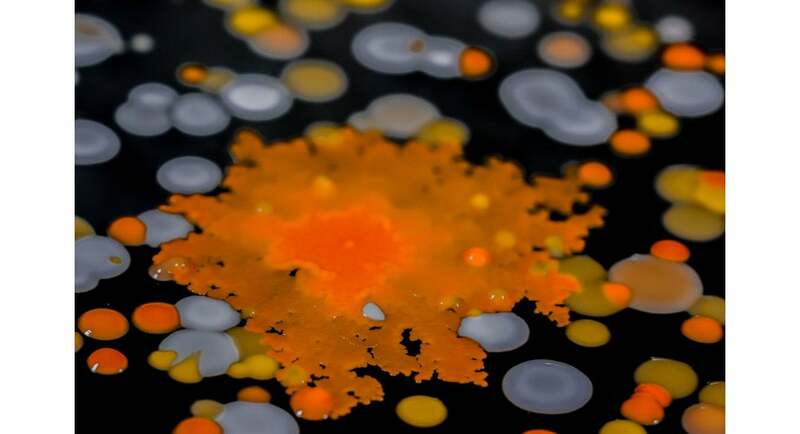 Researchers Roberto Kolter and Scott Chimileski’s large-scale photographs illustrating the intricate social and multidimensional wonder of the small-scale world of microbes are on display in the Science Center show “Scale: A Matter of Perspective” through Dec. 9. 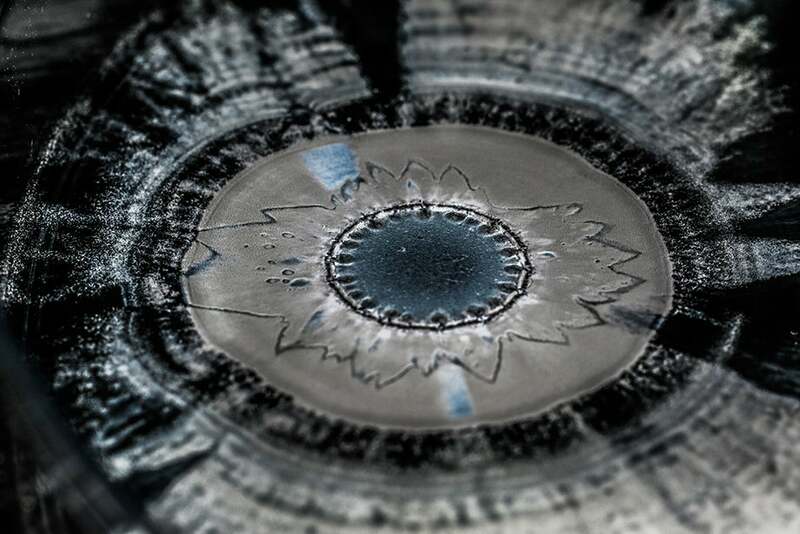 The stunning images, which blend art and science, also comprise the exhibit “World in a Drop: Photographic Explorations of Microbial Life” at the Harvard Museum of Natural History through Jan. 7. 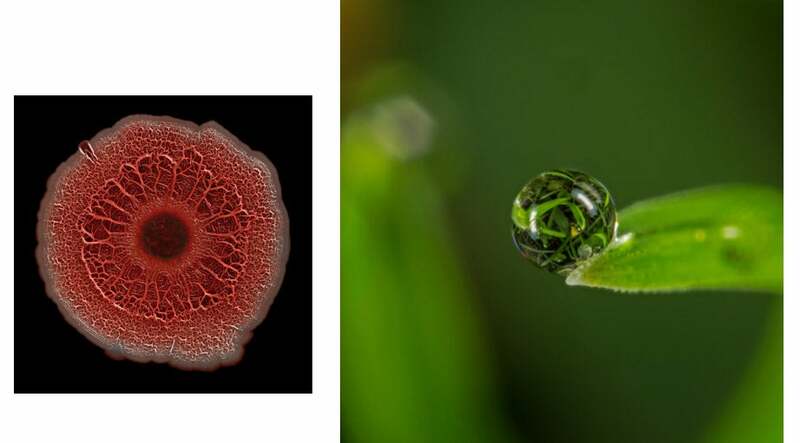 Stained Pseudomonas aeruginosa colony biofilm grown in the laboratory (left); signature image of the “World in a Drop” exhibit, taken on a blade of grass in the Arnold Arboretum. For a hands-on experience, educators, researchers, and the Art+Bio Collaborative will hold a Microbes Mini-Festival on Sunday from 1 to 4 p.m. Visitors can observe thriving microbial colonies on cheese rinds, and watch the aquatic micro-animals known as “waterbears” prowl a landscape the unaided human eye can’t see. The opportunity to work on a collaborative art project detailing a large microbial community and interact with fungi is part of the fun. The images below give a glimpse of what keeps our ecosystems and our lives in balance. These stunning pictures invite people to explore the significant, structural world of the unseen. 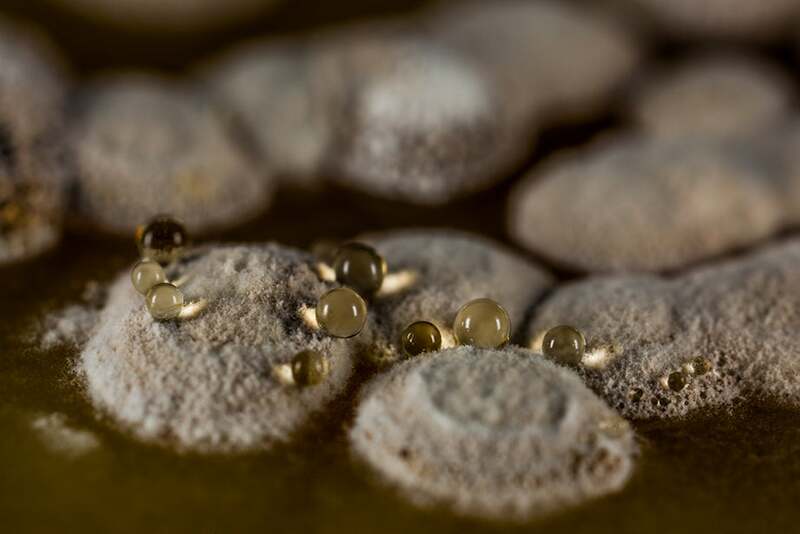 Actinobacteria colony biofilm grown in the laboratory. 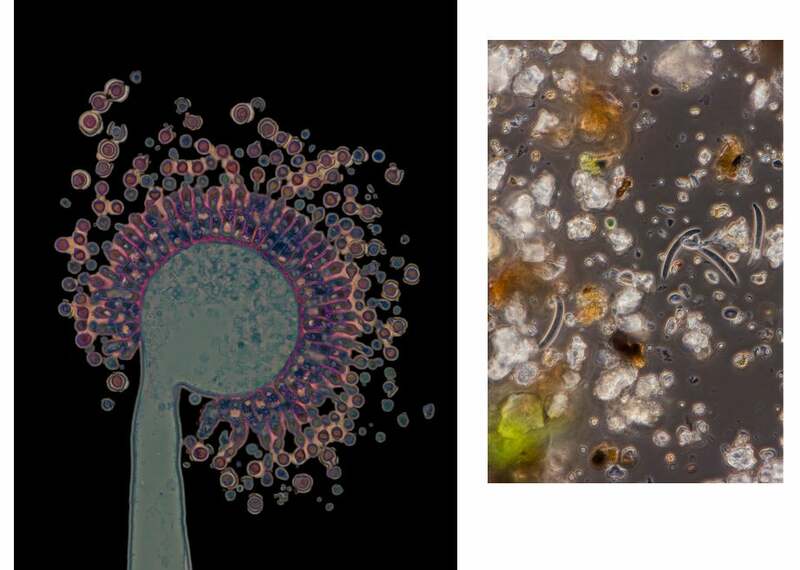 Stained cross section showing a conidiophore of Aspergillus oryzae viewed using a light microscope (left); moss water viewed using a light microscope. 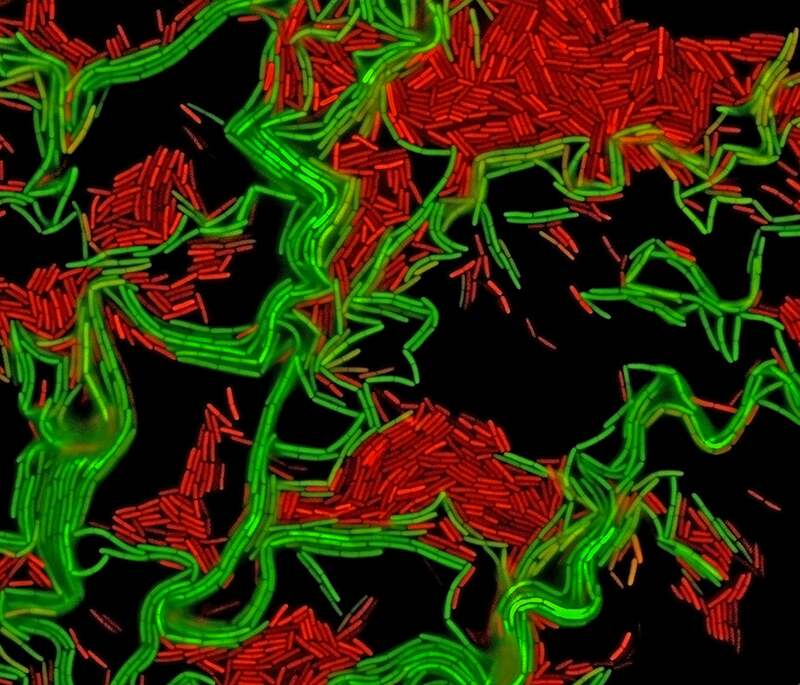 Bacillus subtilis colony seen using a fluorescence microscope. 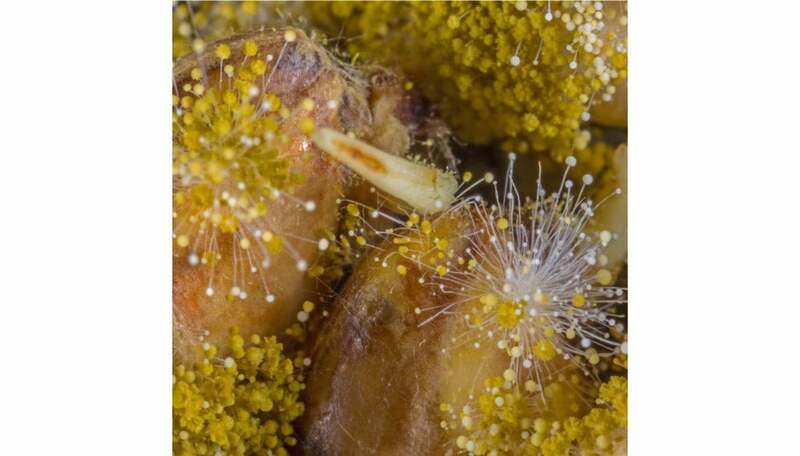 Aspergillus oryzae, koji, growing on rice kernels. 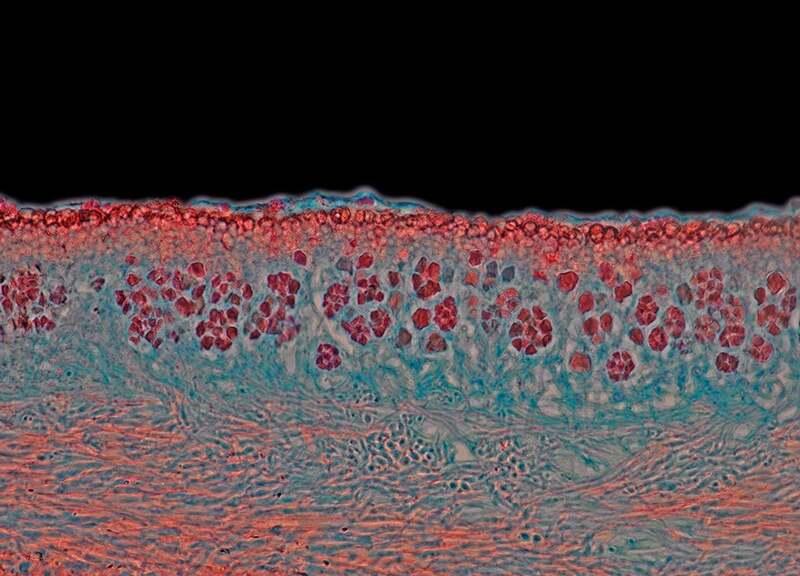 Stained cross-section of lichen viewed using a light microscope. 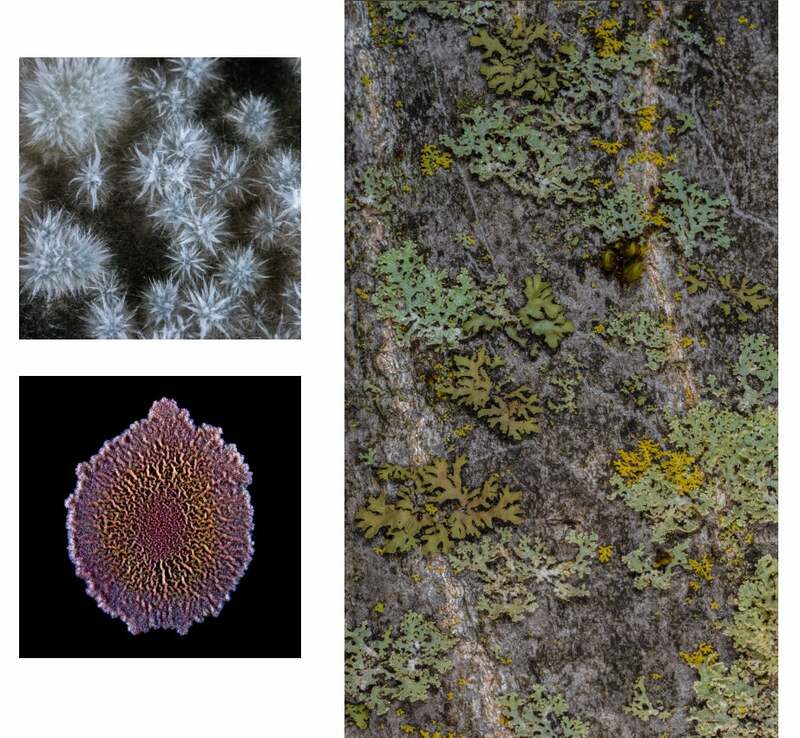 Aspergillus oryzae, koji, growing on rice kernels (clockwise from top left); lichen growing on tree bark in the Arnold Arboretum; and a stained Bacillus subtilis colony biofilm grown in the laboratory. 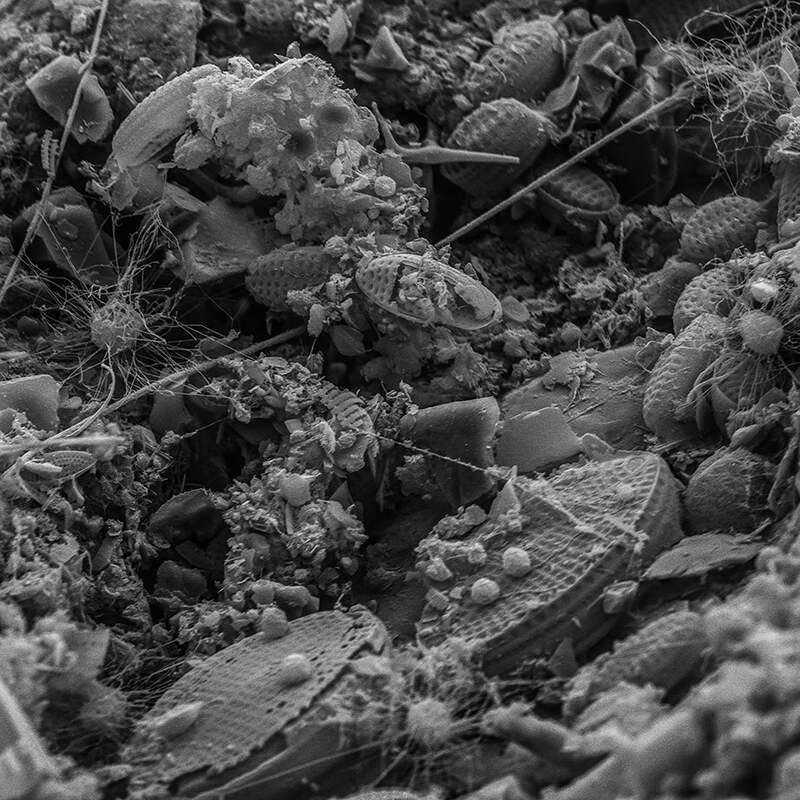 Marine pebble imaged using a scanning electron microscope. Colonies of diverse microbes obtained from cabbage and grown in the laboratory. Streptomyces roseosporus, species of actinobacteria, colonies photographed in the laboratory. 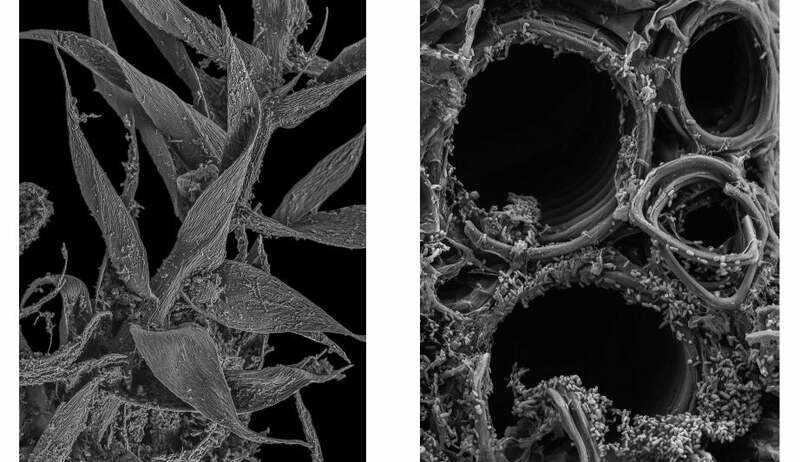 Moss shoot (left) and xylem of an infected squash plant, both imaged using a scanning electron microscope. 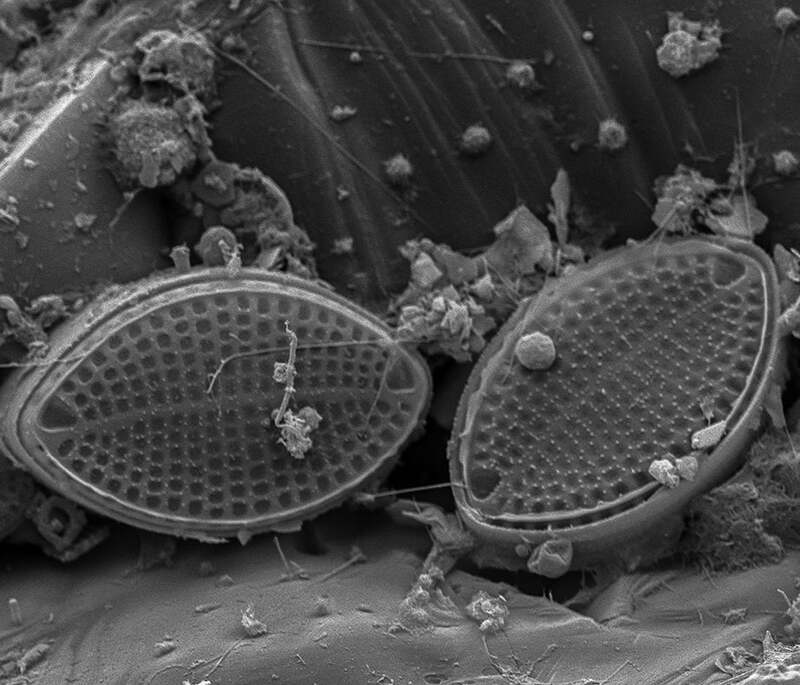 Diatoms imaged using a scanning electron microscope. 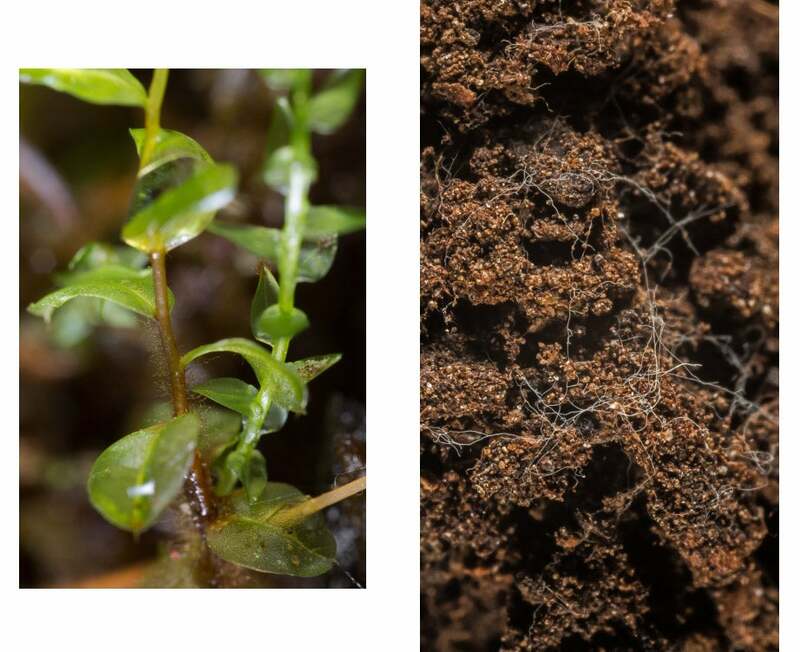 Moss with water drops (left) and soil containing fungal filaments, both photographed in Kittery Point, Maine. Based on better tracking methods, researchers found that women who exercise reduce their risk of death by 60-70 percent, much larger than previously estimated from self-report studies.